*NOTE: Live and learn. Since making this post I have become aware that this stretch of drainage channel apparently originated in the Hasmonean period, before Herod. 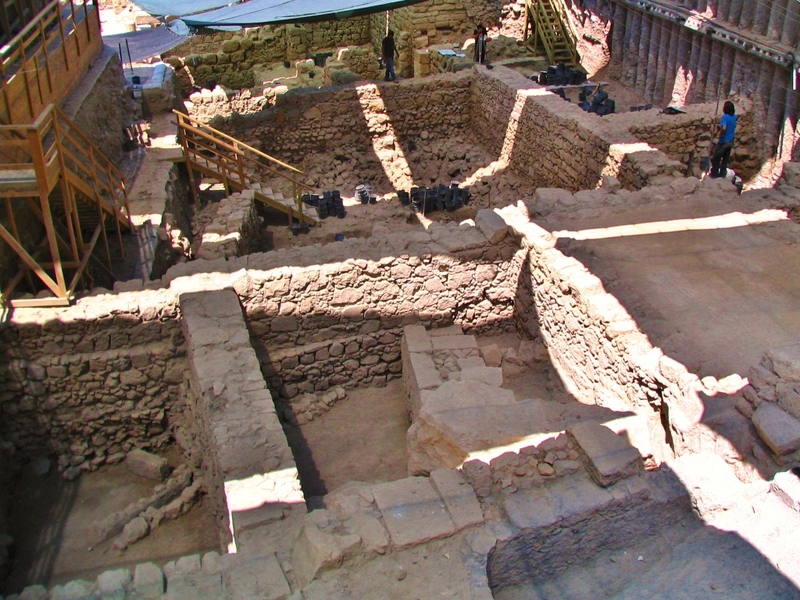 It remained in use through the Herodian period (and probably later ones), however, so perhaps it is not incorrect to say “Herodian”. 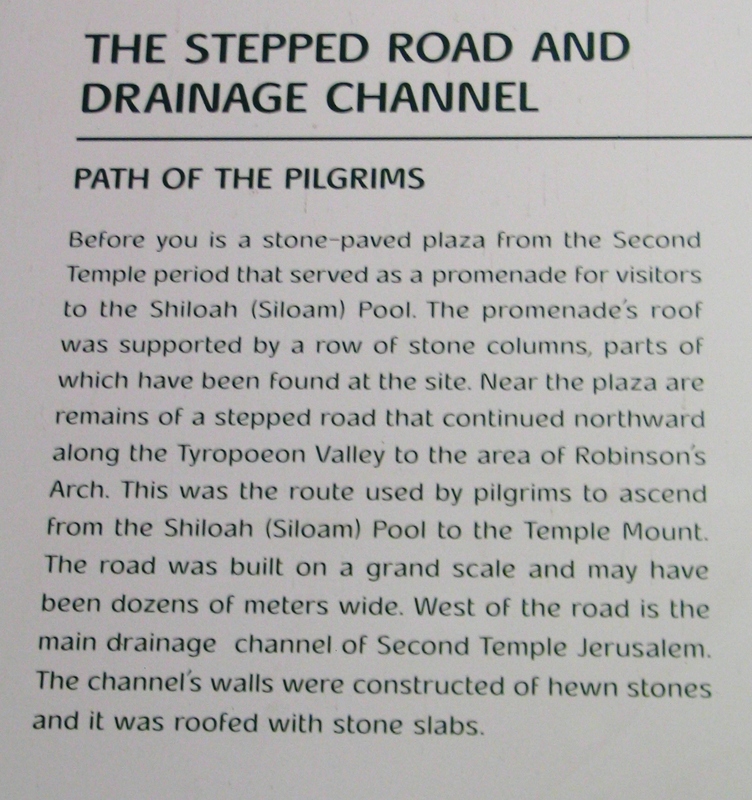 For the story on this route’s northern extension, under the city wall and ending at the corner of the Haram/Temple Mount, see my later post of 22 OCT 2011. 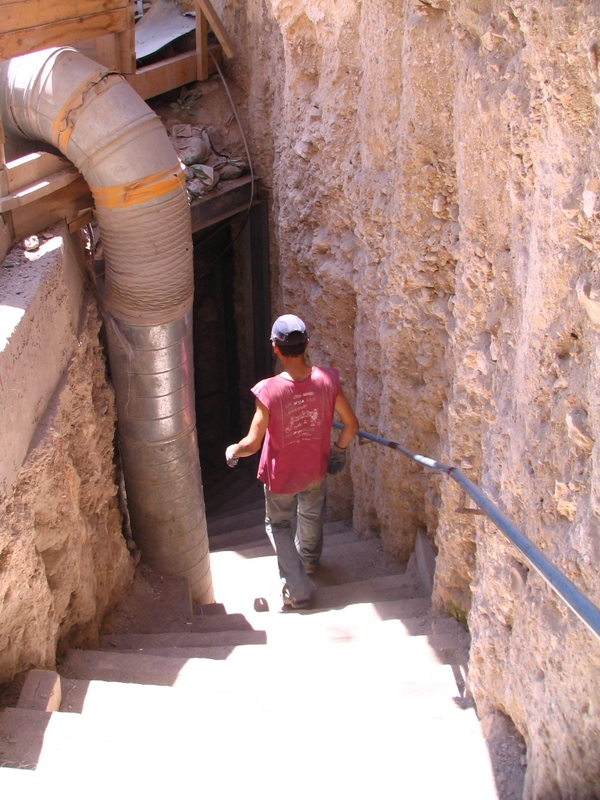 Yesterday I had some folks visiting the City of David, and we discovered an additional section of the cleared Herodian drainage channel (sounds better than ‘sewer’!) newly open to visitors. It had only opened three days before, on Sunday, we were told. 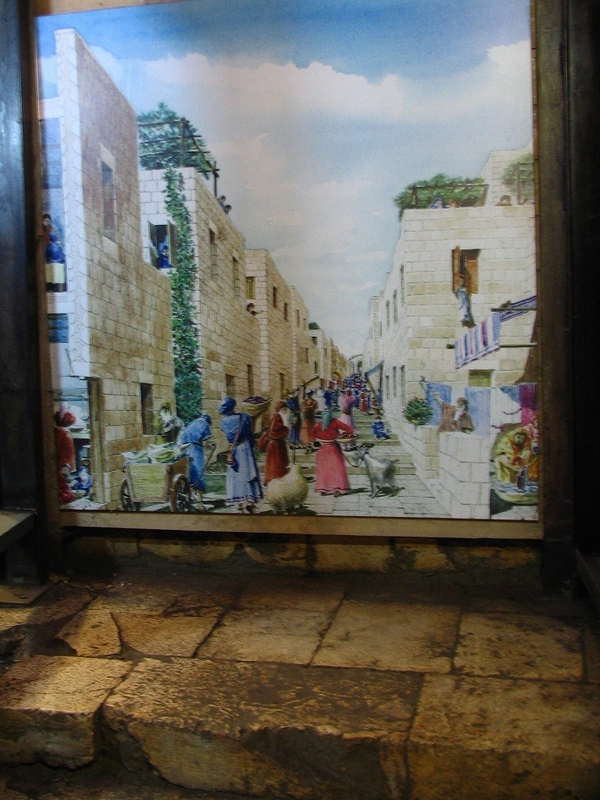 Whereas until now visitors had to exit the channel halfway up Ir David Street, they can now continue on as far as the Givati parking lot excavation area, near the head of the street and not far outside Dung Gate. The following sign calls the entire ascent a ‘road’ — they were shooting for ‘route’, I believe — but most of it is in fact a drainage channel. 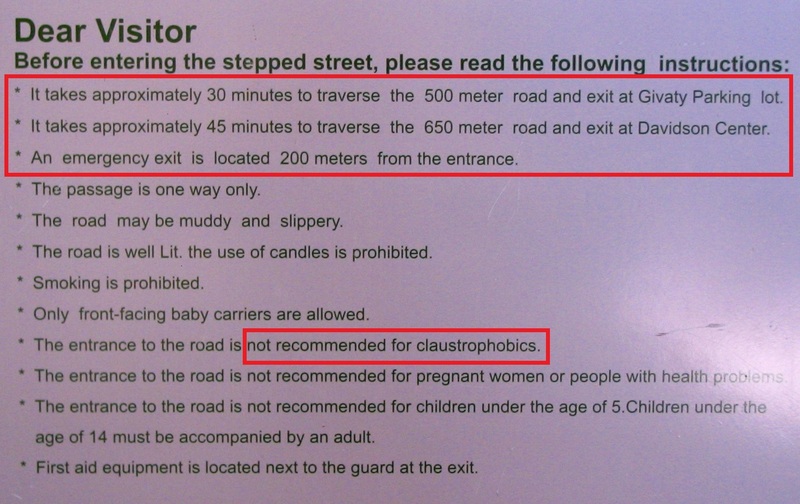 Informational sign at the entrance to the Stepped Street / Drain Channel underground ascent (emphasis supplied). The following interpretive installation gives the big picture. What is often not represented very well, though, especially in media accounts, is how these spaces actually relate to each other. 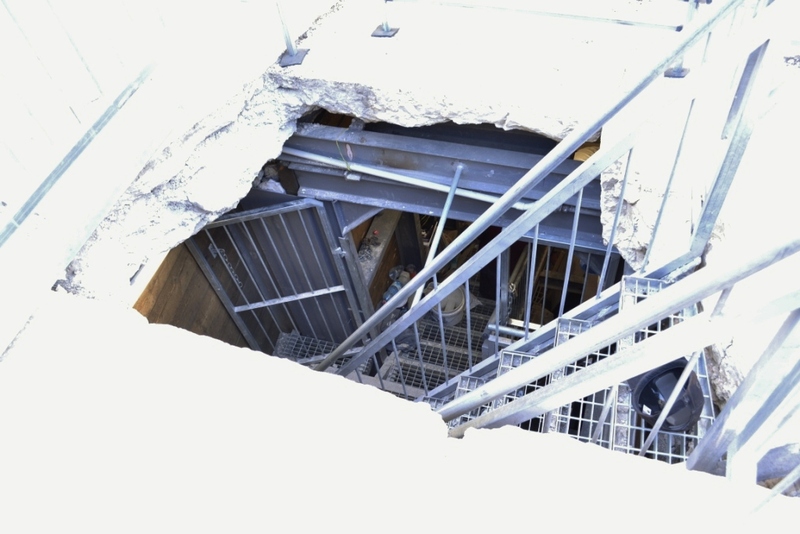 It’s really quite counter-intuitive: You begin ascending through an excavation tunnel, with modern bracing overhead, walking atop a stepped street which in ancient times was open to the sky. Then, after a short distance, the route turns left, ascending a modern metal staircase (going up at least 3 meters in elevation, I would say), and then turns back to the right, continuing through the cleared, ashlar-built channel capped by thick, ancient stone slabs. What is never explained is that (I presume) those slabs are the pavers of yet another street running now overhead. Ascending northward toward the Temple area, the two streets would have merged at some point. 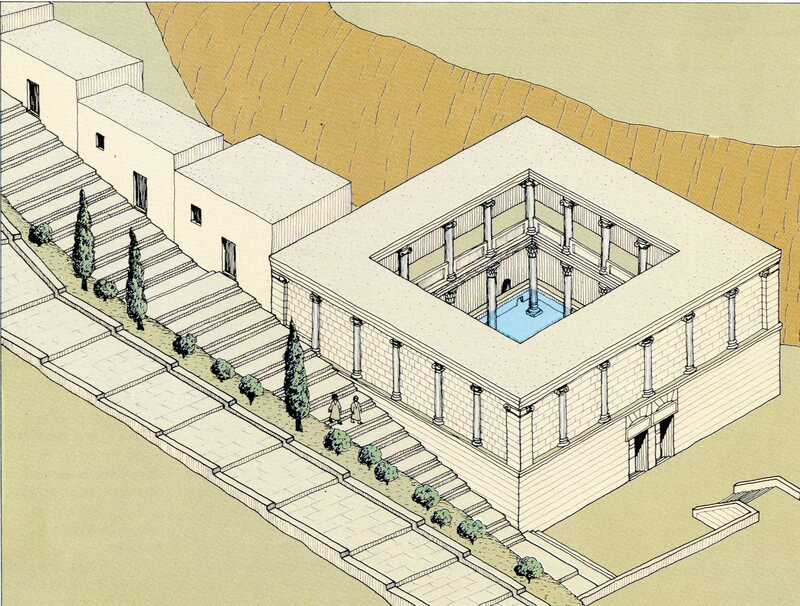 The diagram below shows this exactly (what it doesn’t show is that, as we now know, yet another stepped street ascended on the east side of the pool, along the scarp). Actually, it is also possible that the lower and upper streets date from different periods; this would be quite clear if one pavement were found to actually overlie the other, but I have never heard this addressed. 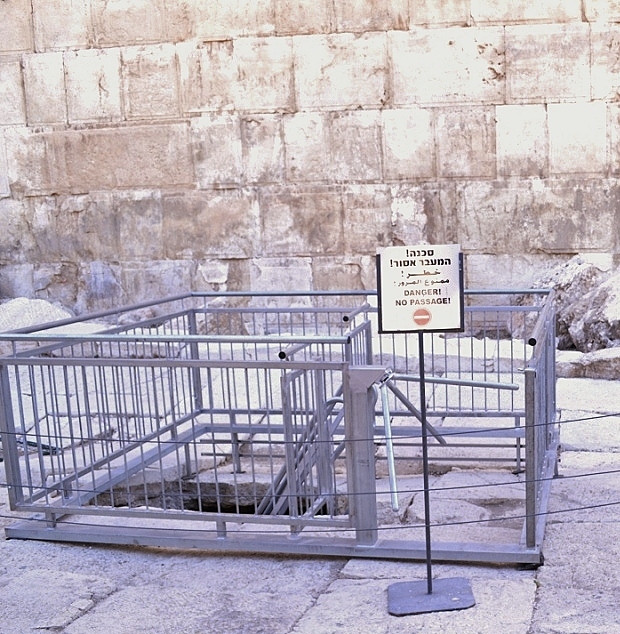 This is the former exit from the drain channel, connecting to a deep excavation shaft halfway up Ir David Street, between the Siloam Pools and the Visitors’ Center; it is now designated as an emergency exit. The newly-opened section proceeds to the right. The newly-opened segment. The sign warns, quite rightly, of the low ceiling. If you didn’t before, you may find yourself walking like Groucho Marx when you come out! 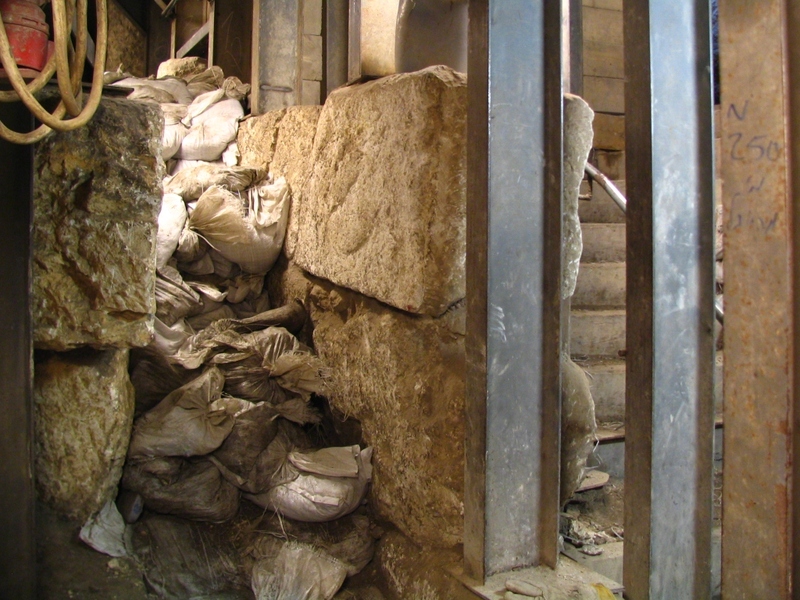 The present end of the newly-opened section: The sandbagged passage (left), to be opened in the near future, leads on under the Old City wall to the SW corner of the Haram/Temple Mount. 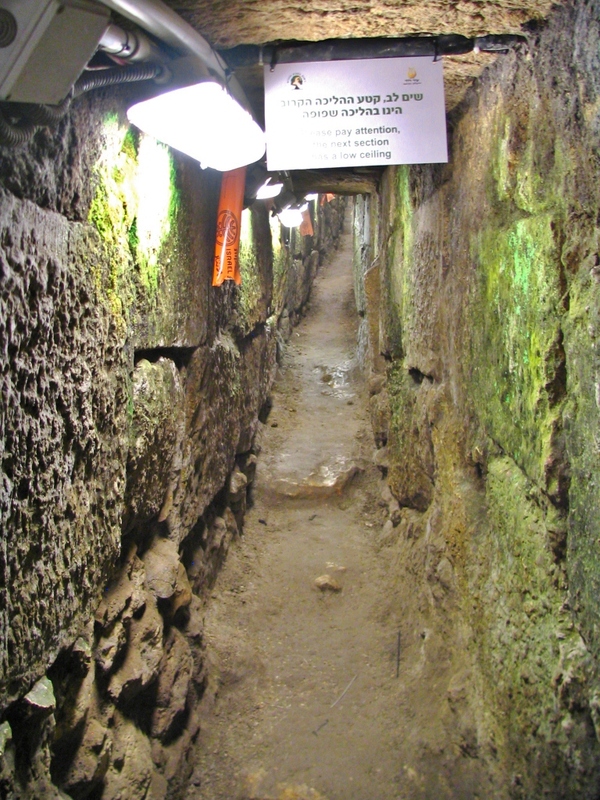 On the right are the channel exit and stairway leading up to the Givati parking lot excavation. 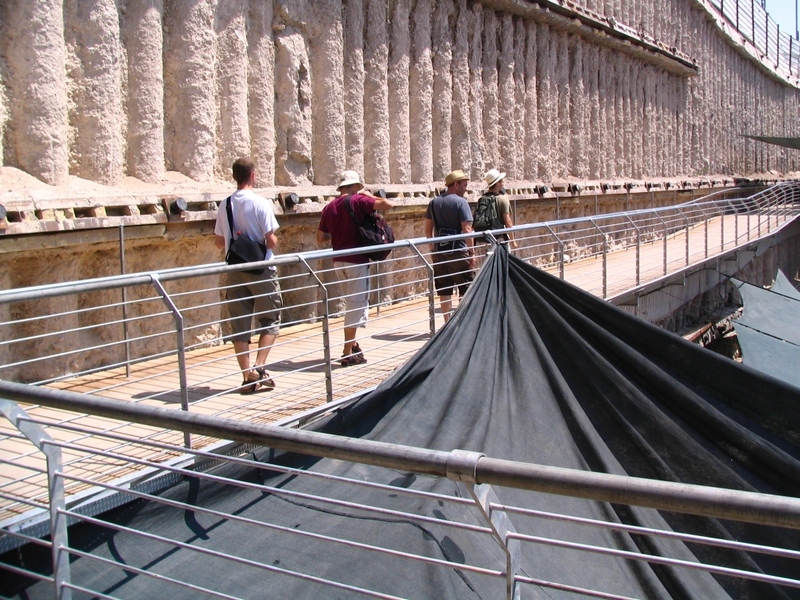 At the top of the stairway, visitors have a view of the excavated areas of the former Givati parking lot, which has been systematically explored over the last several years. 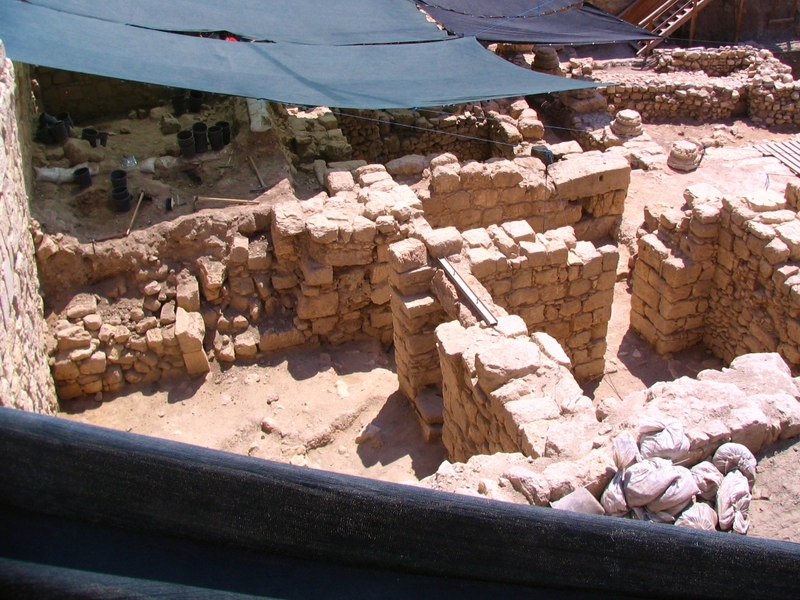 This photo shows Late Roman structures in Givati’s northwest quadrant. This brand-new boardwalk wraps around the northern end of the Givati excavation site, giving visitors a nice view of the exposed remains. 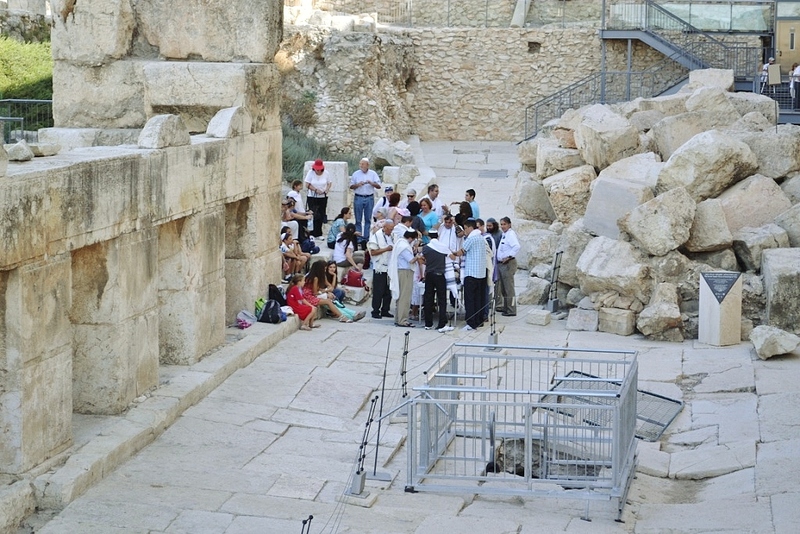 For the story on this route’s northern extension, under the city wall and ending at the corner of the Haram/Temple Mount, see my later post of 22 OCT 2011. 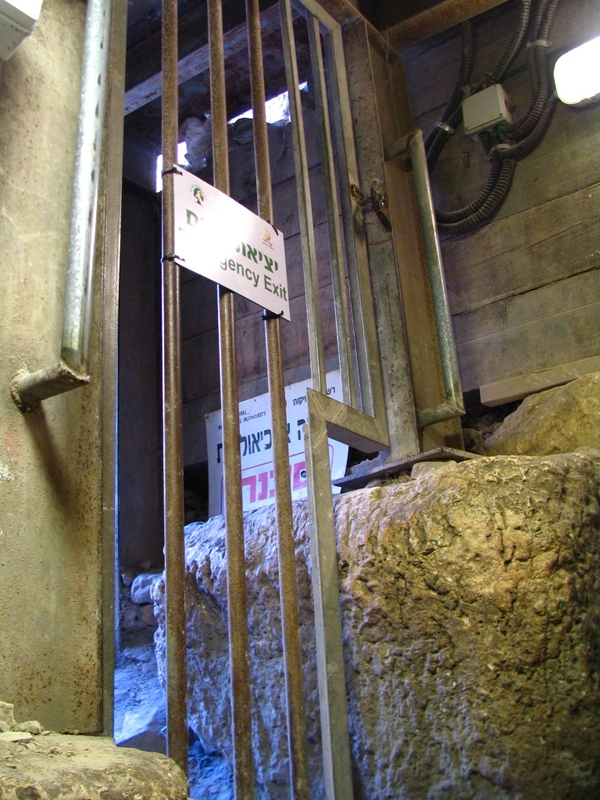 This entry was posted in Archaeology, City of David, Jerusalem Antiquities and tagged Archaeology, City of David, Givati excavations, Jerusalem, Silwan. Bookmark the permalink. I admire this guy, Tom Powers, and I want to meet him my next trip to Jerusalem. Tom, as usual, love your insight. 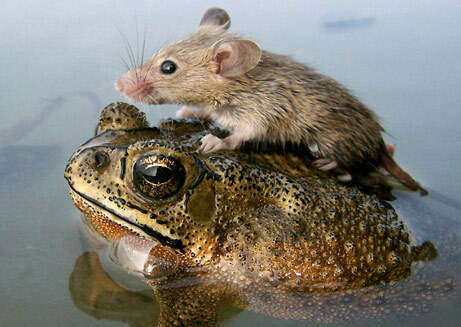 I may be in in Jerusalem in early March and this is top on my list of things to see.